Bill Johnston was a living legend in the 19th-century Thousand Islands area. This site chronicles his life and times. The first six weeks of the Patriot War hadn't gone very well. William Lyon Mackenzie's troops abandoned Navy Island and General Henry Handy gave up trying to attack western Upper Canada. It appeared to outside observers that the Patriot War and threats to Canada had evaporated. But appearances can be misleading. Bill Johnston was spoiling for a fight. 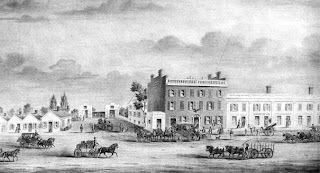 In those days, one of the finest stagecoach stops outside of New York City was the Eagle Tavern on Main Street in Buffalo, then run by Elisha A. Huntley. For a time, it became the unofficial headquarters of Mackenzie and his followers. On or about January 16, 1838, Mackenzie and his top general, Rensselaer Van Rensselaer, 35, met in the tavern's well appointed private rooms with a clutch of new Patriot leaders. Mackenzie's Patriot army had the means to wage war—plenty of muskets, rifles, cannon, munitions, and volunteer soldiers. But, to that point, a surfeit of bungling and cowardly military leaders had proven to be their downfall. In the Eagle Tavern that day sat three men who had the courage, intelligence, and experience to make a leadership difference. Donald McLeod, 59, (January 1, 1779-July 22, 1879) was run out of Canada a month earlier for advocating reform in his newspaper. In the strange nature of politics, the former British sergeant had fought against Van Rensselaer's grand-uncle, General Stephen Van Rensselaer, and father, Colonel Solomon Van Rensselaer, at the Battle of Queenston Heights in 1812, and against Johnston at the Battle of Crysler's Farm in 1813. But that day, McLeod, Johnston, and Van Rensselaer were allies. Based on McLeod's experience, Mackenzie made him a brigadier-general. Daniel Dunbar Heustis, 31, (April 8,1806-1853) gave up a comfortable life as a Watertown, NY, merchant to join the Patriots. A man of pure heart and quixotic principles, Heustis became enraged after reading about the massacres of French-Canadian rebels during the Lower Canada (Quebec) rebellion. He became determined to carry American republican freedoms to his "downtrodden" Canadian brethren. Though Heustis had no military experience, Mackenzie appointed him captain on the strength of his moral leadership. Over dinner and drinks (Van Rensselaer was a lush and Johnston a teetotaler) at the Eagle Tavern, the three new Patriot officers hatched a plan to take over Canada. Of all the attempts at Canadian "liberation" in 1838, their war plan had the greatest chance of success. The attack strategy, generally credited to Johnston, consisted of three parts. McLeod agreed to march an army through the winter snows to attack Upper Canada from the west near Detroit. Johnston and Heustis would raise an army in upstate New York and attack Canada near Gananoque in the Thousand Islands. But, both attacks were to be diversions to draw the British army and militia from Fort Henry in Kingston before a direct assault on the fort. As the military center of Upper Canada, the fall of the fort would have cut Upper Canada in two. A rebel success of that magnitude would have attracted thousands of armed American volunteers to the Patriot army's Kingston stronghold and changed the course of Canadian history. Van Rensselaer set February 22, George Washington's birthday, as the date to launched the assaults. Somehow word of the coordinated attacks reached Dr. Robert Nelson, the principal military leader of the Lower Canada rebellion. He too prepared an assault across the border for February. The icy grip of winter had done little to quell the flames of war. Read about my historical novel Counter Currents that features Bill Johnston. See my Pinterest board that shows Bill Johnston, his family and the setting for my novel Counter Currents. Visit indie publisher Raiders and Rebels Press. Subscribe to Pirate Bill Johnston by Email. For historical info on other rebels, visit Raiders and Rebels. Get info on my two history books on the Patriot War available in paperback and ebooks.